I’d decided a couple of weeks ago – when I was at the top of Red Screes in a biting wind with a set of damp clothes on – all of which moisture had been generated internally – that I needed a new winter coat. My Berghaus Paclite Jacket has served me well over the past couple of years, but it’s not really up to being worn all day when you’re working hard. It just doesn’t handle condensation well enough for that and as a consequence I end up with a wet baselayer and fleece. In the summer I’m only wearing it when it’s raining and that’s fine, but in winter I’m likely to be wearing it all day and that’s a problem. So I’ve been looking for a waterproof coat with the best condensation handling properties. Much research and reading of many reviews led me to the opinion that no-one handles the problem of internal moisture better than Paramo. So I narrowed my decision down to one of their waterproof coats, one of many I should add – choosing Paramo only narrowed the search criteria marginally. Over the past couple of years I’ve become increasing sceptical about the true waterproof properties of Gore Tex, not just after the trouble I’ve had with my Paclite and its somewhat laxadasical approach to keeping me dry, but also from two pairs of boots and a Berghaus Cornice jacket, all of which had Gore Tex linings and all of which leaked like a Government department. So I thought a new material was probably in the offing anyway. Paramo’s waterproofing is down to Nikwax and a directional water management solution. However, rather than bore you with techno-babble, have a look at the details here. The result is a rustle free fabric that is smooth to the touch and comfortable to wear next to the skin. In fact, rather worryingly as it happens, their coats don’t look waterproof at all. Anyhow, the three or four different coats they do were all to be found in Go Outdoors; which is a 20 minute drive from me in Stockport and their discount card scheme ensures that whatever price they offer on their Internet site is also available in store. I spent 30 minutes trying on the Cascada, Alta II, Aspira and Pajaro jackets – all great garments but varying hugely in price. The Alta II seemed to be the best compromise in functions, warmth and price, so I spent another 10 minutes convincing myself it was the right thing to do – I always have problems at this point in the buying-cycle, spending a large amount of money on a single item requires commitment and self-assurance and it took me a while to talk myself into the right state of mind. The jacket retails at £220, I got it for £198 with the discount card. On the way out of the store I spotted a “Price Guarantee” leaflet and picked it up on impulse. Many of these deals are so complex and require you to jump through so many hoops that any money you do get back is invariably not worth the hassle. But I picked it up anyway and read it when I got home. It seemed fairly simple – they would guarantee the price of any item of equipment purchased with the discount card – against any high street or Internet retailer. Now that’s interesting I thought. Mostly this sort of deal would be limited to high street retailers only and probably within a certain distance of the store. Not only would they refund the difference, but they would add 10% to that too. I searched the Internet using Google Shopping (which I liked better when it was called Froogle – clever name and exactly what I am) and found the same jacket on-line for £20 cheaper. I rang the GO help line and was immediately told that I couldn’t apply for the scheme because I’d already bought the jacket! There was no mention of this in the scheme’s terms and conditions, so I asked to speak to the supervisor – the young man put me on hold for a minute and then came back to confirm I did qualify after all. Unfortunately, because I’d bought the coat in store and not on-line I had to go back to the store to get my refund. I drove back to Stockport armed with my till receipt and a print-out of the on-line retailer that was offering the coat cheaper. I took my details to the checkout and the girl went off to check the validity of the offer on their Internet terminal. she came back and told me it was all OK and she would refund my credit card with £36. This was about £15 more than I was expecting, and I said this to her. But it turns out that I had misunderstood their offer. I was expecting the £20 difference, plus 10% of that difference, so about £22. However, they pay the difference, plus 10% of the value of the item – excellent!! 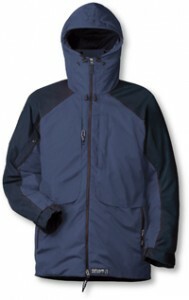 So I got he jacket I wanted at a great price – all I have to do now is wait for a wet day to test it. Hopefully that will be next spring sometime 🙂 I’ll update once it’s had a proper day out.